What is JS8Call & JS8? 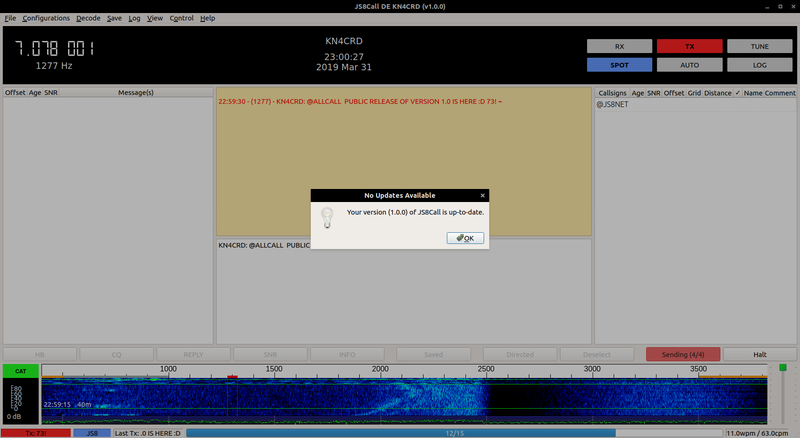 JS8Call is an experiment to test the feasibility of a digital mode with the robustness of FT8, combined with a messaging and network protocol layer for weak signal communication on HF, using a keyboard messaging style interface. It is designed to connect amateur radio operators who are operating under weak signal conditions. JS8 is a mode with the freedom to transmit arbitrary length free-text messages using an adaptive text compression scheme (15-18 wpm average, > 20+ wpm on some messages). Callsign list that shows which callsigns you can hear and which can hear you. Directed message structure to allow messages to you to be received anywhere in the passband. Directed commands to request specific information from other stations (like their GRID). Store-and-forward message inbox that allows messages to be left at intermediate stations to be retrieved later. Band hopping based on a schedule. Time drift controls for synchronizing to other stations when no other time source is available. Macros with text replacement for SNR, GRID, and other information. Spotting of station locators to PSKReporter, HamSpots, APRS-IS, and JS8NET. And is open-source (GPL) and free to use and/or modify. If you’ve been interested in trying JS8Call, but didn’t want to have to sign up for the groups.io or upgrade frequently while in development, now is your time. The 1.0 release is a solid foundation for weak signal communication and I hope that you enjoy using it. If there’s anything you need, feel free to email me kn4crd@gmail.com. Happy to answer any questions you might have in the meantime.